At a friend’s house I saw this ‘wunderkabinet’ of creatures. It fascinated me on several levels. 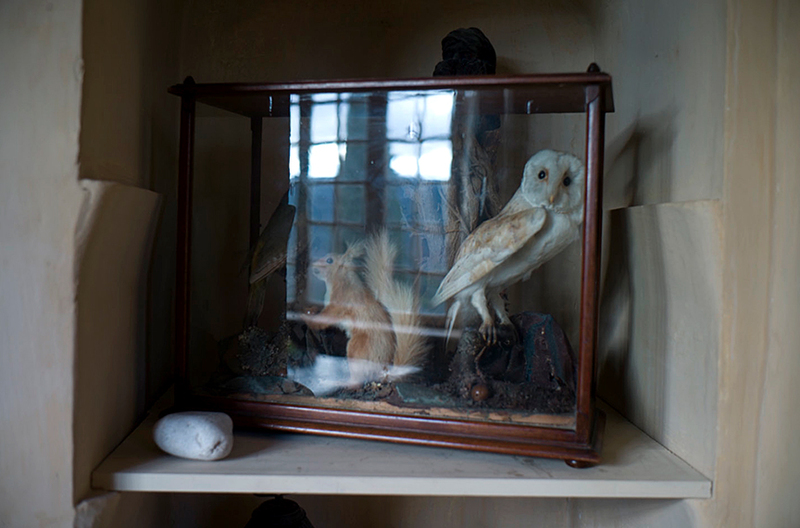 On the one hand this is just a glass box with an owl and a rabbit and some woodland background, but looked at another way, which is what was so interesting to me, it is similar to a photograph. Someone made this! They brought all the elements together, they put them in a frame, they charged the whole thing with their own sense of mystery, value, color, form, context, reality, all in a search for meaning or beauty. Isn’t that what we all try to do? Put a frame around a moment of time and try and invest it with all our feelings for the precise fraction of a second when we saw or felt something! Often we are not completely certain what it is that emanates from our observation, but the call is clear to us; make this moment count! So, too, in this glass box of wonder. The effort here, by a taxidermist, or a hobbyist, or someone who just wanted to preserve something they found beautiful, is extraordinary and invites both speculation and wonder. Isn’t that what photography does. This entry was posted in Still Life, Uncategorized and tagged Bonnieux, France, Interior, Provence, Still Life on March 19, 2015 by joelmeyerowitz2014. Yes, that is what photography is. Stilling a fleeting moment that would otherwise go unseen, unperceived. And preservation of beauty through taxidermy. So true. The Wunderkammer is a wonderful microcosm, a personal world and to photograph it is not only to preserve it but to share it for others’ enjoyment.